A map, a map, my Kingdom for a MAP! A good map, or detailed route slip, is a neccessity for any recreational road bicyclist intent on having an enjoyable bicycling experience, whether it is in the local area of the cyclist, or in another city, county, state, or country. I wonder if he plans on having me ride all those? Hey Lady, better you than me! 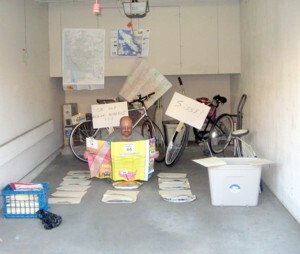 In January 2005 I gathered a treasure trove of maps at the LA Travel Show, and wrote about the adventure. While some of the maps were specially made Bike route, and trail, maps, most were standard issue city, and state, and even country maps. Some of those do have route details for cycling, but it is important to understand that they are useful regardless. Many such maps can be requested for free, or for the cost of postage. I had big plans to write about those maps long before now, but life kept getting in the way of giving me the time. I wish, now, that I'd tried to do a little at a time because this stuff IS a resource that should be known, and utilized. The purpose of this new series is to make my way through my stash of stuff, and any new stuff I might receive, or get my hands on in the future. 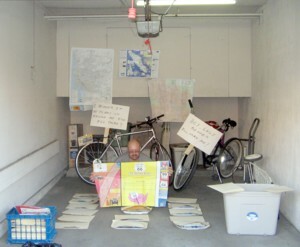 I want to write about not just the maps, but any other useful cycling info I may discover in the material. I also plan to try to request maps by mail from various resources, and write about them, and to check out various websites that sell, or post, maps, and/or route descriptions, that I have in my sidebar. I will be including info so you can get the latest versions of the maps yourself. Preparing oneself for the journey makes for a safe, and enjoyable, experience. A year ago I organized the collection into folders, and labeled each one by city, state, Province, or Country. Hybrid: Oh, my aching wheels! If you have used the maps I write about, and/or traveled the locales they cover, please send me the story of your experience(s) in 1500 words, or less, for consideration to be published, with credit, here. 18. San Luis Obisbo Area. 1. Bahamas - Jeez, this region has a lot of freakin' Islands! !